I'm not sure how it happened, but this week somehow became crazy-town week for me. It's not because of Thanksgiving. I'm not hosting Thanksgiving. I'm probably not even going to be cooking anything at all for it. Hosting is my thing, and if I was, I'd probably just be super excited. Instead, this Friday, Eugene and I are leaving for the airport at some ridiculous still-dark hour to head down to Puerto Rico for my grandmother's 98th birthday. I'm excited about this, but the limited amount of time before we leave totally stresses me out. 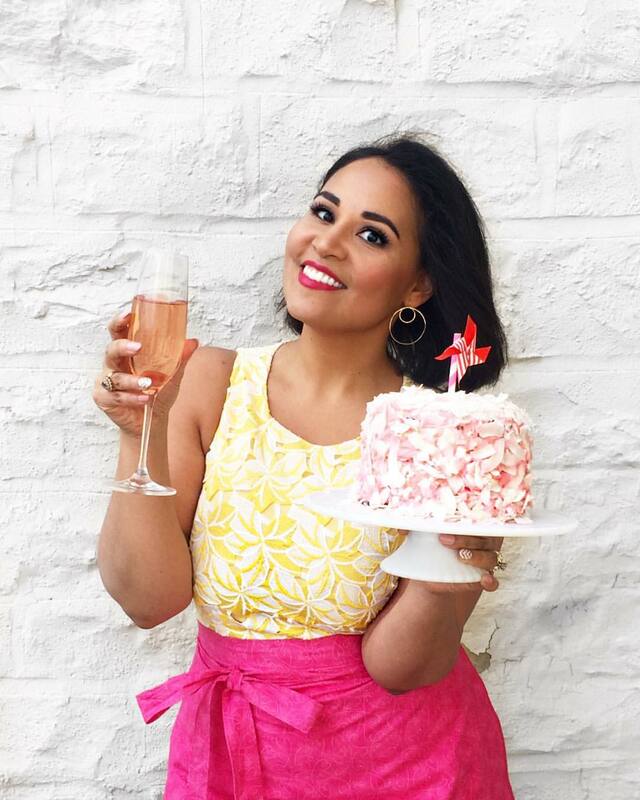 My friend (and fellow chef lady!) Melissa is going to be staying here house and Hudson-sitting, which means that instead of the crazy disaster I usually leave behind when I travel, I need to leave things clean and semi-organized so Melissa doesn't regret agreeing to this plan. For the actual meal, we're going to Eugene's parents' apartment in Brooklyn, so I don't have to cook, but it means that everything needs to be done before we head over to their place (an hour away). And between now and then, I have a long list of things to get done. Articles to write. Photos to edit. Clothing to fold. Toiletries to buy. Luggage to pack. Nails to paint. Hair to wash and blow-out. Even a holiday e-book deadline (more about that, soon!). So in the middle of all this crazy, I got an idea. 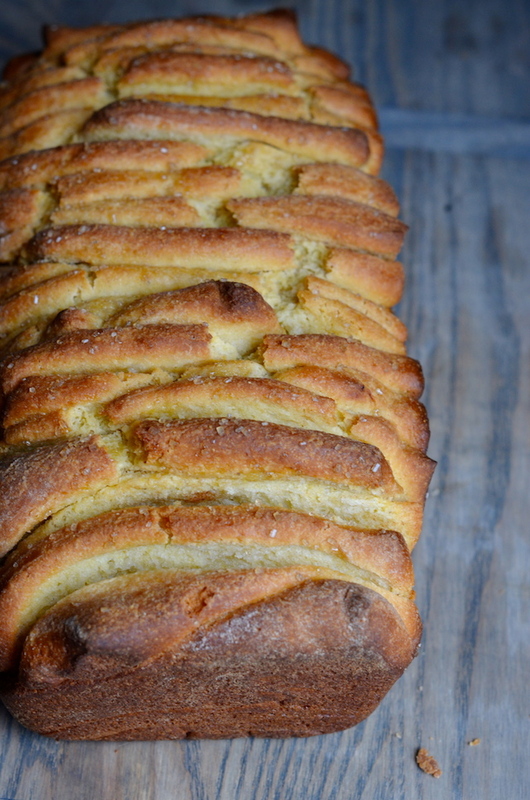 The idea was for a pull-apart bread made out of yeasted cornbread. 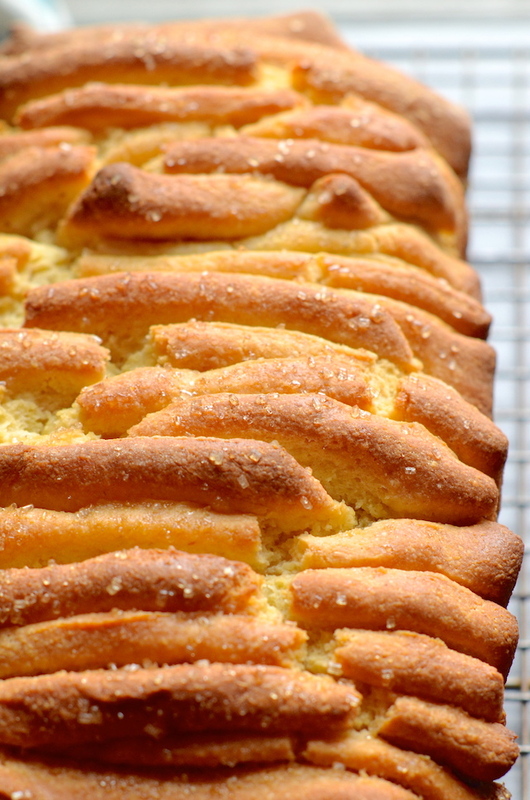 Something like a cross between brioche and cornbread. A little bit sweet, but neutral enough to work as both a savory dinner roll, and sweet breakfast bread. It popped in my head while I was working on something, and grew and grew to the point where I just couldn't ignore it, despite my major to-do list. I jumped up and within seconds I was writing up recipes and proofing yeast and kneading dough. Testing. Trying. And here's the thing. The results? So awesome. The bread itself came out amazing. It's probably a little late to include on your Thanksgiving table, but would still be super lovely any other day of the year. And I'm ridiculously proud that I made it happen. Because sometimes you just have to let the big ideas happen. Even if the timing isn't right. I hope to post again tomorrow, but if I don't, I want to wish you a very Happy Thanksgiving. I hope you know how grateful I am for all of you who read and comment and share and make it possible for me to make a living doing what I love. Whisk together yeast, 1 tablespoon sugar, milk, and water in the base of a stand mixer with dough hook attached. Let sit 5 minutes until foamy on top. Beat in remaining sugar, eggs, 1/4 cup melted butter, and vanilla. Then mix in cornmeal, 2 cups flour, and salt. Beat with dough hook, adding slightly more AP flour if the dough is too wet. It should pull away completely from the sides and form a ball. Knead at high speed for 3 minutes. Pour oil into a large bowl. Form dough into ball, place in bowl, and flip around once to coat with oil. Cover loosely with plastic wrap and let rise in a warm place for one hour or until doubled in size. Preheat oven to 350 degrees F. Generously grease a 9”x5” loaf pan. Punch down dough. Sprinkle counter with flour, then roll out dough to 1/2” thickness. Brush top with remaining melted butter. Use a knife or pizza cutter to cut dough into 2” by 4” rectangles (don’t worry if they’re not all even). Stack the dough rectangles, then arrange on their sides in the prepared loaf pan. Squoosh in any extra pieces that don’t fit! Sprinkle with a bit of raw sugar, then bake for 40-45 minutes or until puffed up and golden. Keep an eye on it—if it starts to darken too quickly, cover loosely with aluminum foil. Let cool in pan for 20 minutes before transferring to a cooling rack.